Oooh that smell, can't you smell that smell? Lynyrd Skynyrd might have made that phrase famous, but the Piper Wai All Natural Charcoal Deodorant coming to the Shark Tank in this years 2015 Christmas Special Episode 712 is finally going to do something about it. Piper Wai's all-natural ingredients naturally neutralize armpit odors while absorbing the moisture from perspiration using a charcoal base. Considering most deodorant's and antiperspirants are filled with unhealthy chemicals, the Piper Wai Deodorant's one of the best all-natural alternatives on the market, especially after becoming an Official Shark Tank product. While many business partners appearing on the Shark Tank have been working together a long time, the two owners of Pier Wai all-natural deodorant go all the way back to their first lemonade stand at a very early age. From that first taste of feeling what it's like running a successful lemonade stand, Jess Edelstein and Sarah Ribner already knew someday they'd start a real business together. Exactly how they leveraged a lemonade stand into an all-natural deodorant product and the beginnings of an All-Natural Brand can be seen in the PiperWai Indiegogo video below. Piper Wai recently completed the successful crowdfunding campaign on Indiegogo raising over $28,000 on August 20, 2015. While those numbers are impressive for the first of many other all-natural products to follow, a single night after this year's Shark Tank Holiday Special should easily set brand new records for this start-up business. The biggest question most people will have is "What does Piper Wai Deodorant smell like"? The reviews unanimously said they liked how PiperWai smells, coming from both Men and Women. It's an all-natural fresh smell that's not overbearing. One review said it smells so good they wanted to eat it though I doubt it's recommended. As far as comparing this new Shark Tank product to other all-natural antiperspirants and deodorants on the market, one review stood out as someone who's tried them all. The 5-Star Review say's in part, "I have tried numerous natural deodorants and honestly, they are all garbage. They either fail mid-day or don't prevent sweating. I have been using the PiperWai Natural Deodorant for a month now and absolutely love it". 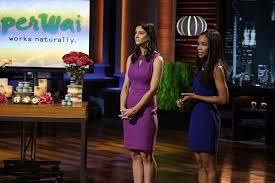 Overall ratings for the PiperWai before their Shark Tank appearance is an impressive 4.6-Stars out of 5. Watch PiperWai Deodorant on the Shark Tank 2015 Holiday Special this Friday night, 12/11/2015, and see if the Sharks really can smell a good deal when they see one. Ifs as ordered product morning after show aired. Could only order express shipping. 6 days later and no product. Checked order status on their site. I tried calling company several times and a message picks up saying the Google subscriber is not available. Huh?! Was going to be a Christmas present. Hopefully it gets here on time. Not happy I had to pay express shipping of $5.00 and no show as of 6 days later. I ordered this Jan 2 and a month later I still don't have my order. I have purchased from other people from Shark Tank before and have never has this problem! !